I'm super excited about this new show! Hosted by Tori Spelling, judges Erica Domesek (P.S. I Made This), Stephen Brown (Glitterville Studios) and Jo Pearson (Michaels Crafts) decide through two challenges which crafter gets to take home $10,000 (that's a lot of glitter)!! This first episode pitted Cheryl Burchett, Traci Remley, and Christy Tomlinson against eachother in two challenges. The first challenge had them all making a duffel bag to carry sports equipment - out of sports equipment - in just one hour! Christy's bag was full of whimsy with fun trims and fabric, Traci's had an ingenious tennis racquet bottom, and Cheryl's large duffel had a bowling-bag theme. The judges dismissed Traci after this round, saying that her tote wasn't constructed well. She had used hot glue to attach the racquet to the bottom of the tote. While I'd agree that putting a draw-string on the bottom to support the racquet, and allow removal for washing, would have been more inspired, I don't think that it was cause for her removal. The competitors had just an hour to design and create their bags, and of course that would result in some flaws. Which leads me to Cheryl. Her construction problems were limited to corner pieces that didn't catch in seams, but that was the least of her issues. She didn't finish. With an incomplete bag, she should have been sent home... but the judges let her stay on. The second challenge, a head-to-head between Art Teacher Cheryl and Professional Crafter Christy was 5 hours to create a playhouse out of school supplies. They were each given 4 assistants, in addition to the one they had brought with them, shopping carts filled with rulers, pencils, backpacks, notebooks, and more... and access to an amazing array of craft supplies and building materials. Each competitor stayed true to their roots. Cheryl delivered a little red schoolhouse with fun details like ruler shutters and pencil windowboxes... and a largely unfinished inside. Christy came up with a completely interactive schoolbus theme, full of her trademark whimsy. Cheryl's schoolhouse with fun details won her the big check. 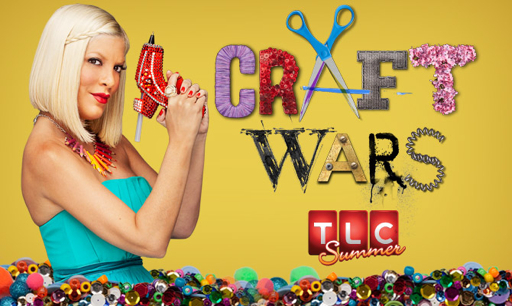 Before watching the show, I was ready to deliver a completely snarky tirade about how crafters are being portrayed on TV (similar to the recent portrayal of "hoarding" and dishonest couponers), but TLC did an amazing job of showing how fun and inventive we crafters are. They came up with great challenges, and provided lots of great materials to create with. I did have one big disappointment. They didn't recognize the online personas of any of these amazing crafters! Even Erica, as a judge, was introduced as the Author of PS I Made This... the book. With no reference to her blog of the same name. How can a show that is internet-savvy enough to include the hashtag #CraftWars on the screen NOT give reference to their competitors' websites? Or at least a reference to their true crafty selves. Cheryl snuck in that she is an art teacher, but did you know that Traci has a shop where she sells vintage and refurbished items? (link in her name above) Really - the chance at 10K is a pretty nifty prize, but a little promotion for their sites and shops wouldn't have killed the network, would it? Join me tonight, Tuesday July 3rd, 7pm in watching Episode 2... and back here tomorrow to check out my recap!